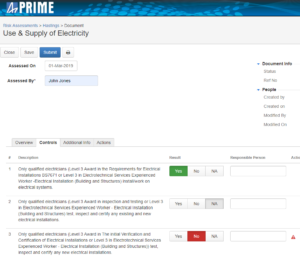 The new PRIME Risk Assessment application reflects a change in focus from identifying hazards and scoring the likelihood of the risk being realised to concentrating on the control measures and their implementation. Users have found this approach is simpler to use and have also commented on the improved look and feel of the application. Before starting to complete a Risk Assessment, the contents of that particular assessment can be viewed to see whether it is relevant or not. To select a Risk Assessment, simply click on its title. When the individual Risk Assessment has been clicked, there are two parts to the screen. Firstly, boxes to record who carried out the assessment and people assisting them, the date of the assessment and the date it is being completed online will be tracked. The lower part of the form contains four tabbed headings (Overview, Controls, Additional Info and Actions), which each need to be worked through. Here, the people involved in the Risk Assessment (not the lead assessor) will need to be recorded. 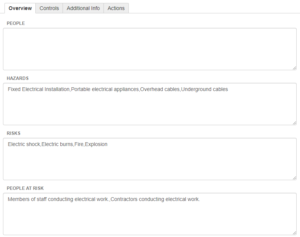 On this example, we have reduced the number of risks and hazards down to their most simple elements. For example, here the only risk identified in respect of electricity is electric shock, electric burns or fire/explosion. All fields can be edited, so that the document can be tailored and site specific. The next tab is a completely different format to the previous Risk Assessment application and is a central part of the document. It shows the control measures that should be in place. These are listed as a set of questions to which the user simply answers yes, no, or not applicable. Controls are based on industry norms and legislative requirements, so should assist users in reaching an acceptable standard. If answering no to a control measure, it will require the user to raise an action to rectify the situation. Here, a summary of the actions and description of the actions (control measures) should be entered. This action can be assigned to an individual, so the user can effectively delegate to a site supervisor, for example. The action will not close until the user goes into the system and closes the action out. New control measures can also be added into the system. 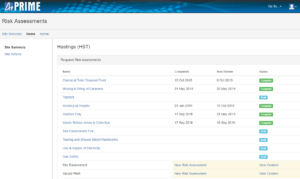 In addition to completing the suggested Risk Assessments which already have the hazards, risks and controls completed, the new system allows users to generate an entirely new Risk Assessment on any subject. For example, if there is open water on a site, an Open Water Risk Assessment can be created and tailored specifically. 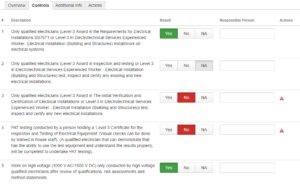 Users will be able to see at a glance what actions are outstanding from the Risk Assessment on a summary page under the fourth tab. Each Risk Assessment is then submitted into the system and becomes a permanent record which can be printed off for the park’s files. These safe working procedures will form the main part of a site’s safety policy. Once in place, a system must be used to ensure that procedures are effective and being implemented. This monitoring system will normally be a series of checks backed up by an audit process. Only by doing so will a business know that the policy is being implemented. Taking the time to carry out Risk Assessments and keep them up to date minimises the chances of an accident happening. It should, therefore, be a good investment of time and money if done properly and not just carried out as a paper exercise. You can see more details on the Prime Risk Assessment application here and find out how it could help you manage your risk assessment requirements. You can read our earlier article on Risk Assessments here which details why they are key, the consequences of not risk assessing and how to carry them out.